Whether you go for straightneck or crookneck, yellow summer squash is sweet and tender. The two varieties are similar and used interchangeably in recipes; yellow straightneck is smooth, long and cylindrical, while yellow crookneck has a bulbous bottom and a thin, bent neck. Steaming yellow squash, either whole, sliced or cut into pieces, is a simple cooking method that preserves much of the vegetable's flavor and nutrient content. Rinse the yellow squash thoroughly, using a vegetable brush to remove dirt and grit. Cut off both ends of the squash. Don't remove the peel because it contains most of the flavor and nutrients. Cut the squash into the desired sizes. You can slice it into rounds or cut it into quarters or chunks; cut the squash into fairly uniform pieces so it cooks evenly. If the squash is small, you can leave it whole. Place 1 to 2 inches of water in a large saucepan. Bring the water to a boil. 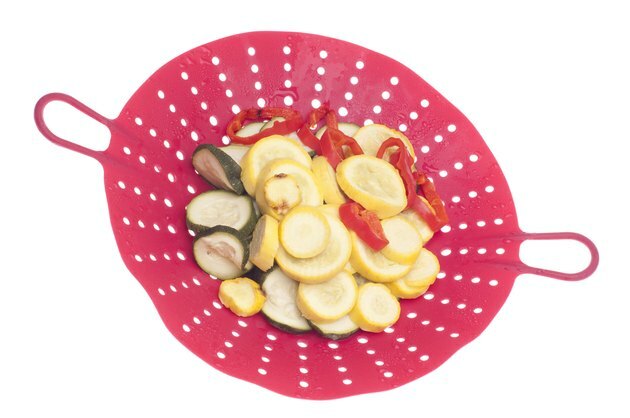 Place the squash in a steamer basket or large, heatproof colander. Place the steamer basket in the saucepan. Be sure the water is below the bottom of the basket. Cover the saucepan and turn the burner to medium-high so the water continues to boil gently. Steam the squash until you can easily pierce the squash with a fork or the tip of a knife. Thin slices or small chunks generally steam in 4 to 5 minutes, while a whole squash may take 10 to 12 minutes. Remove the steamer basket. Let the squash drain, then serve it hot or incorporate it into recipes such as squash casserole. If you don't plan to serve the squash immediately, store it in the refrigerator and use it within three to four days.